Every Wednesday Karen Jacobs EdD, OTR/L, CPE, FAOTA hosts the Sargent Choice Test Kitchen in StuVi 2 Apt. 2302 from 8-11pm. 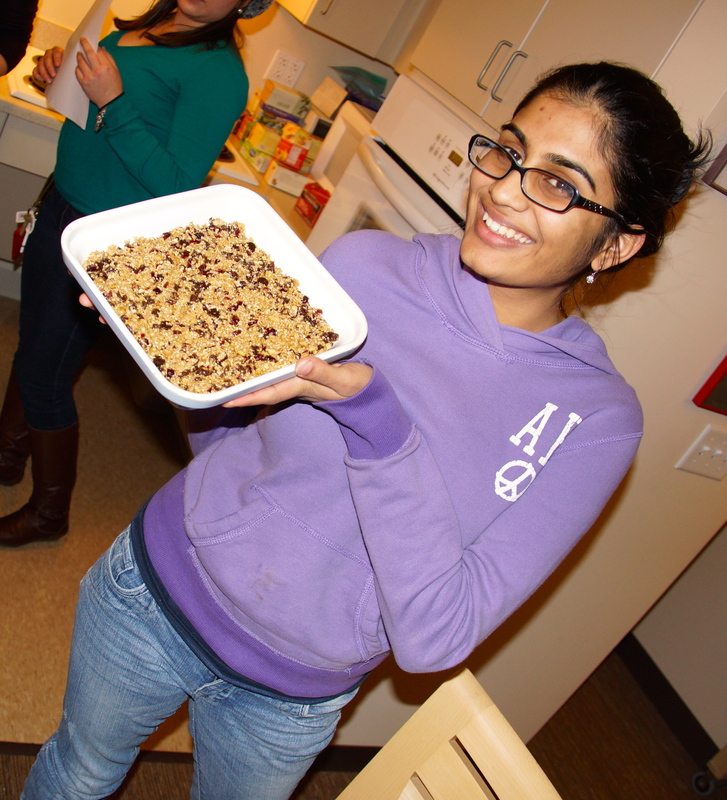 She kindly welcomes the BU community to make and test new Sargent Choice recipes while we eat, talk and play games like Apples to Apples or Bananagrams. We’ve all experienced days were there simply isn’t time to prepare a snack. Whether it’s hurrying from one activity to the next, or oversleeping and needing to hustle to a morning class, it is easy to skip breakfast or a much-needed snack. Without proper nutrition, the rest of the day can be a struggle to get though. At the Sargent Choice Nutrition center, we understand that your life is hectic, which is why we want to prove that being busy doesn’t have to cost your body the good nutrition that it needs and deserves. By making sure to have a stock of nutritious food, you can more easily make healthy decisions on-the-go. This week in the Test Kitchen we made Meal Makeover Mom’s “Grab-and-Go Granola Bars,” a perfect breakfast or snack for those on a move (or just a delicious snack in general). One of the great things about this recipe is that it’s simple; one batch is enough to keep you stocked throughout the week. Not only are these better for you than store bought granola bars, but they are also fresher and give you total control over what flavors go into them! How cool is that? You get to make custom-made granola bars. Who knows, maybe you can even sell some to your friends. I know I’d buy one. The students loved these bars and we hope you will too! All you have to do is mix everything together, then throw it in a pan to bake. Super simple and it will only take you a couple minutes. Thanks for another wonderful recipe Meal Makeover Moms! 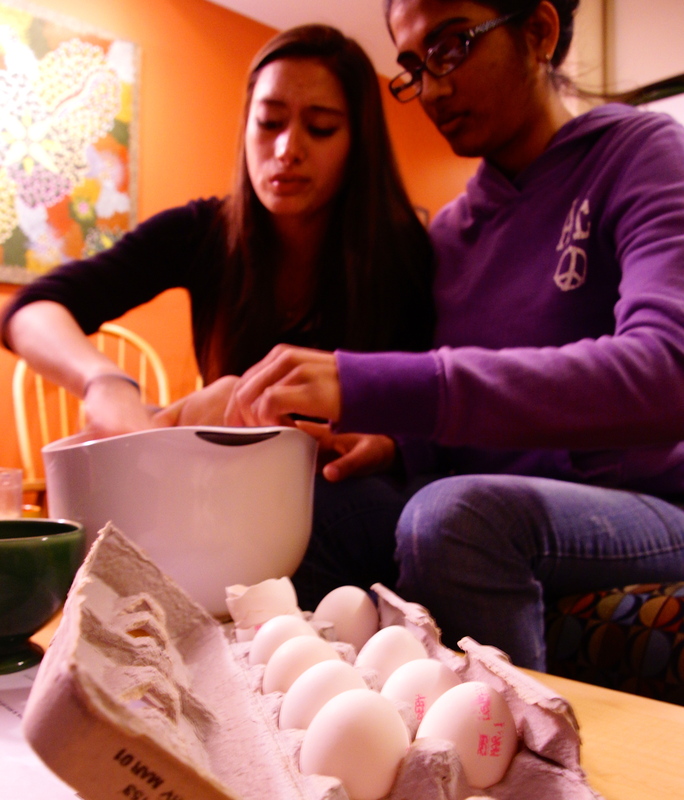 3) Whisk together the eggs, honey and vanilla in a large bowl until well blended. Add the oat mixture and chocolate chips and stir to combine. 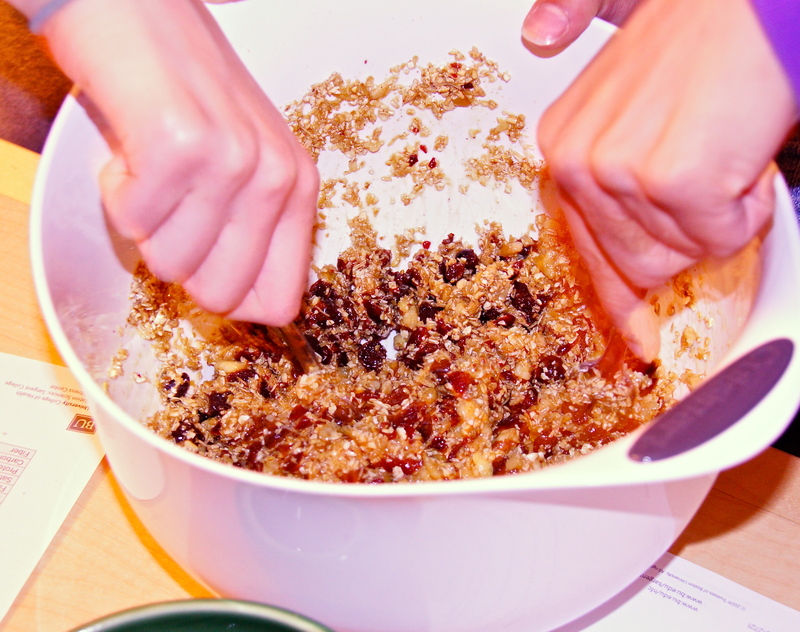 4) Spread the mixture evenly in a prepared pan, and flatten gently with the back of a spoon or rubber spatula.